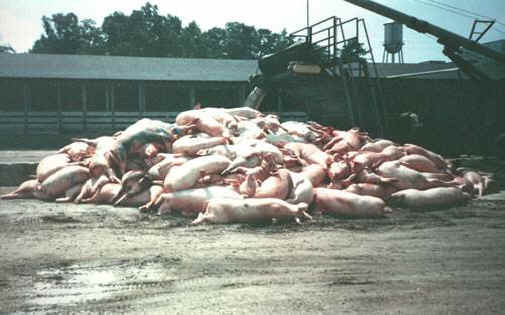 (Pig Exploitation - Factory Farming - 24-a) "Dead piles" are a constant presence in factory farms. While pigs are fed massive amounts of antibiotics to keep them alive in conditions that would otherwise kill them, hundreds of thousands succumb to the stress of violent mutilations and intensive confinement. Dead pigs are sent to rendering plants, where they are made into dog and cat food or into feed that will be given to pigs, chickens, and other farmed animals.